I am collaborating with the children’s librarian in my city to run a monthly code club for kids 8-12. Our first meeting was last Monday. We had six kids show up. I knew three of them from two years ago when they were in my after-school 4th grade Code Club. It was great to see them again. 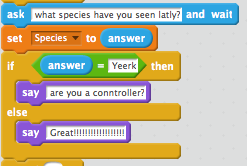 The other three were mostly new to Scratch. 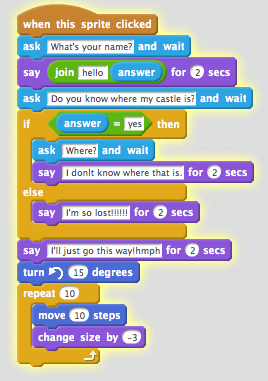 One of the coder’s grandmother stayed for the session and we set her up to play and learn Scratch, too, and she jumped right in a made a Chatbot project. I knew we were going to be using the library’s Chromebooks, so I set up a teacher account and a class along with some student accounts. I figured a few of the coders might have a Scratch account already. One said he did but didn’t remember it. They all ended up using one of the class accounts. That made it easy for sharing their projects at the end of the session. 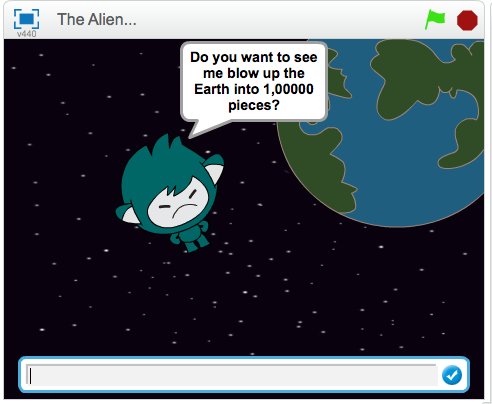 Chatbot is one of my favorite projects from Code Club World. 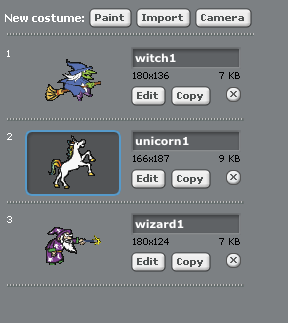 It requires only one Sprite and Stage, is interactive, and the projects can become very creative very quickly. It introduces the conditional block “if then, else”, a powerful, useful coding block for decision making. 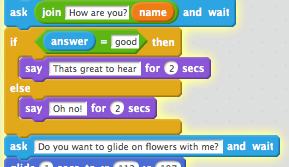 It also introduces the ask-answer block pair as a quick way to introduce interactivity. The expert coders sort of remembered Chatbot but were very happy to revisit it. By the end of the session, everyone was successful in setting up a Chatbot and coding an “if then, else” block at the least. Some added more complexity with movements and costume changes. 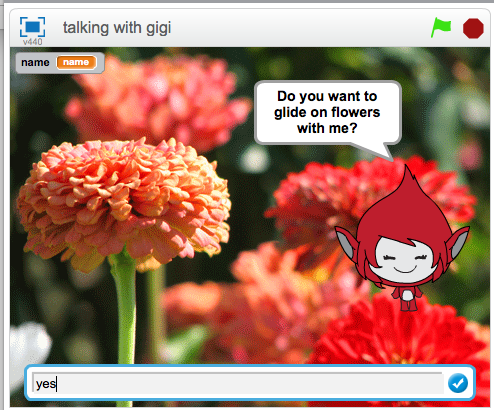 It was fun to see the different, creative takes on Chatbot. The coders shared their projects, even though some were not complete and we played them all through. I put them in our October project studio and liked them all. I thought the English/Spanish Chatbot project was a great idea – it could be a cool way to show what you’ve learned from Spanish class. We asked the club members what types of projects they wanted to work on in future meetings. I heard ideas ranging from Ghost Busters, Pong, anything with horses, to a platform game. Good ideas! We are hoping more kids sign up and we can grow the club a bit. It was great to be back working with Scratchers. 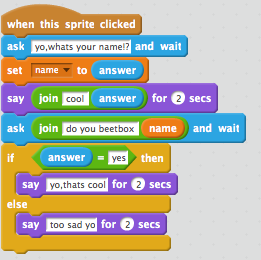 My after-school Code Club starts up next week. More new Scratchers. 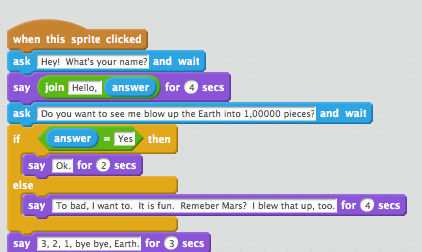 Today was the second Scratch session with a 3rd grade math class and it was a blast. Last week I introduced Scratch to them and they also tried out the Etch-a-sketch project from Simon Haughton’s Scratch Progamming lessons. 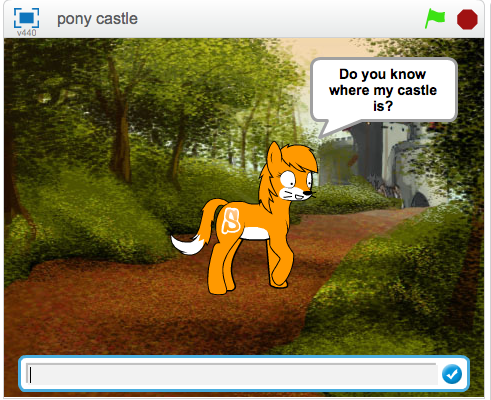 Some of them spent some time during the week playing with Scratch during free time in math class. This week I wanted to introduce the “ask and answer” blocks and “if-then-else” so I came up with this Trick or Treat lesson, just in time for Halloween. First I verbally asked them “Trick or Treat?” Most of them said, “treat” of course. 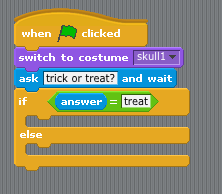 Then we brainstormed what a “treat” would look like in Scratch – do something (animation), change the costume, say something, play a sound. They of course had big ideas like candy falling from the sky or the Sprite eating a pile of candy. I tried to translate that into more programable language. Then we brainstormed what a “trick” would look like. 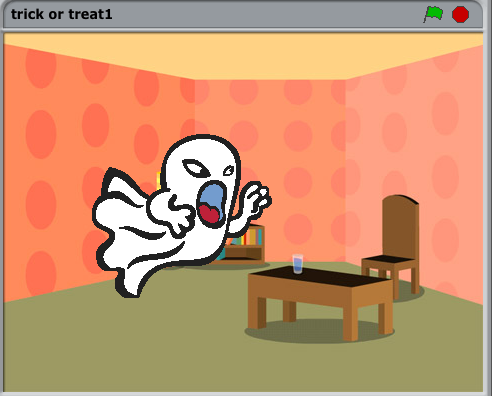 I showed them my sample project where a ghost asks “Trick or Treat” and if you say “treat” he turns into a bowl of cheesepuffs otherwise he turns into a scary ghost. I also had different sounds and a bit of animation (the Sprite turns and grows). Next it was their turn. I directed them to picked a background for the stage and a Sprite. Their choice. We had a lot of ghost and ghouls, but quite a variety of backgrounds. Then they asked the question “Trick or Treat?” and set up the answer to equal trick or treat. Also their choice. We tested it and they noted it didn’t do anything. Well, not yet. 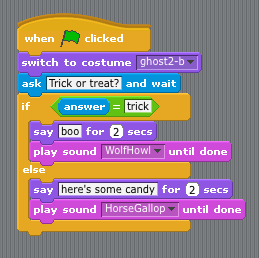 So we added a “say” block for each condition depending on if what they were looking for, trick or treat, and the opposite in the else clause. Then I had them add two sounds, one for each condition. In hindsight, I should have saved the sounds for last as noise level went up both from excitement and the random sounds playing in the room. That was it, with just enough time to share their work. Their math teacher suggested this and it turned out to be a great idea. The projects were saved in a shared directory and all the laptops were closed and I displayed each project up on the screen for all to enjoy. When it was their turn, I asked the project creator if they wanted me to answer “trick” or “treat” first, then played both cases for all their classmates to see. I’m very pleased with how this project went with this group of 3rd graders. I would definitely do it again- just have them add sound last.